As one of the few online destinations where players can enjoy the marvelous games of Wager Gaming Technology, Red Stag Casino provides its players with something different in contrast to casino’s that are powered by mainstream developers. And that’s just of one of the many reasons why a high number of players decided to try their luck at Red Stag Casino. Red Stag Casino is one of the few places where online gambling fans can enjoy the thrills of Wager Gaming Technology software. By promoting the games produced by this niche developer, they provide players with a real alternative to try something different. This is just one of the reasons for why an increasingly high number of people choose this casino over its counterparts. The collection of games overall isn’t particularly high, but constantly growing and expected to cross the threshold of 200 titles. 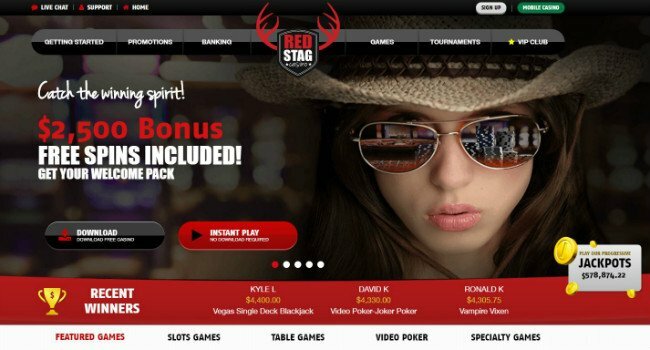 Deckmedia is the parent company running Red Stag online casino as well as a couple of other US friendly operators. This is one of their best selling points and not surprisingly, the vast majority of their players actually reside in the UK. They are the ones more likely to understand and accept the limitations of the payment methods in terms of diversity and speed. These players are also quite happy with the opportunity of gambling online with a casino that enjoys a solid reputation. Wager Gaming Technology is not the biggest or the most popular software developer. While it can’t compete directly with the likes of NetEnt or Microgaming, it has the advantage of promoting some truly unique games. They have been channeling their attention and energy on providing US players with the finest assortment of slots. The recent strides made in the niche of table games and video pokers didn’t go unnoticed and brought it into the attention of Red Stag Casino. In addition to the classic 3 reel slots and the 5 reel versions that took over the Internet, Red Stag Casino games also include 7 reel slots. They have more winning combinations, which brings them in the spotlight, but otherwise the visuals are not much different. WGT isn’t exactly famous for state-of-the-art graphics or animations, but the games always run smoothly even on mobile devices. While they are fairly original compared to mainstream slots, some Red Stag Casino reviews highlight the fact that some games are quite similar, using only different skins. Those who go over the list of Red Stag slots will discover a couple of new additions as well as classic titles. Cool Bananas, Dolphin King, Dragon Master, Eastern Dragon, Shaaark, Tiki Lounge and Vegas Party are the first that come to mind. Wager Gaming Technology has slightly improved its games in terms of visuals, without sacrificing the response time. The visual upgrades are obvious for those familiar with their games, but some might miss the 3D graphics available at other casinos. The few complaints issued in the past against the software developer have all but vanished. This is a clear indicator that WGT paid attention to those recommendations and made the necessary changes. A Red Stag Casino mobile section is available for those who want to play slots on smartphones and tablets. There is no dedicated app for the moment, but navigation is just as smooth on the small screen of mobile gadgets. Players don’t have to download anything and all the games can be played straight in the browser. The number of slot machines available goes up overall, including the ones that can be played on these gadgets. However, there are less than 40 slots and a handful of video pokers and table games currently available, so the process is relatively slow. Blackjack variations and baccarat versions that can be played against real dealers are even fewer. This leaves a lot to be desired and Red Stag Casino is supposed to make some changes to bring its portfolio of games in line with today’s expectations. The Red Stag Casino's welcome bonus is a massive $2,500 and this offer is available to all new players. Compared to mainstream casinos, this goes well beyond the industry standard, but it is in line with the Deckmedia casino approach. In fact, there are a couple of sister websites that go even beyond this amount, but they do so at the expense of tougher wagering requirements. When players make the first deposit and have it matched up to $2,500, they also receive 10 free spins. The 35 times wagering requirements can be a nuisance for those who are not used to clear bonuses over a short period of time. One month should be plenty for the vast majority of those who gamble here, especially if they accept to focus mostly on slots. On the off chance that this Red Stag welcome bonus looks like too big of a responsibility players have the option of choosing another package. The 275% bonus on first deposit up to $550 works in a very similar way, but it only needs to be played 25 times. 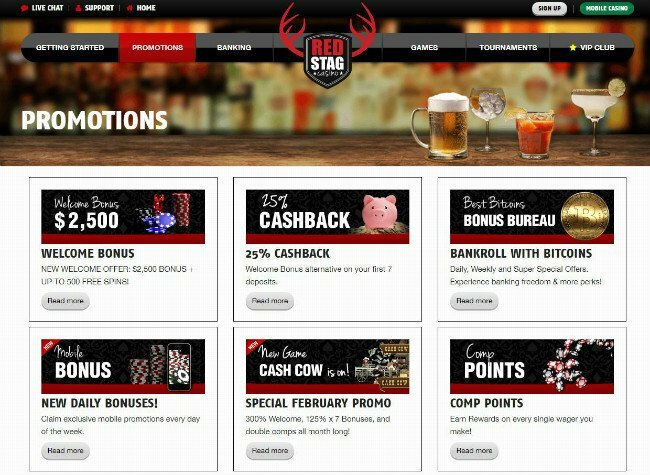 These are the introductory offers, but Red Stag Casino promotions also include a couple of ongoing campaigns. For limited periods of time, players can also receive free spins on selected slots, particularly the new additions. They come in bundles of 10 or 20 bonus rounds and the resulting profits need to be played through 20 times. One thing that players from the United Kingdom should be aware of is that for them, the play through demands are twice as difficult to meet. Players who have an account as well as new customers who use the S10FREE Red Stag Casino bonus code will be eligible for 10 free spins. Whenever the casino offers stuff for free and with no strings attached, it requires players to use such a promotional code. Failing to enter it when making the deposit will cause players to lose eligibility for cash bonuses, free spins and any other perks. It doesn’t hurt to get in touch with customer support if you miss out on the opportunity and try to make things right. The Red Stag Casino's rewards and special promotions for VIP players are the ultimate prizes, available exclusively for loyal customers. There are a couple of drink-themed promotions on Monday, Thursday and Saturday offering free spins and cash. These themed campaigns have the particularity of offering bigger rewards to those who have attained VIP status. With each step made up the leaderboard, and the number and frequency of prizes increases. The Red Stag VIP Club isn’t open based only on invitation, but players can enter it by their own volition, if they accumulate enough loyalty points. Reaching the top of the food chain is just half of the challenge because players also need to maintain a certain number of loyalty points every month. In return, they will be provided with bonuses ranging from $100 to a maximum of $750 per week. In any case, deposits are doubled, so whatever players feel comfortable committing, will be increased twofold. The Chaser Bonus will reward between 25% and 50% on all deposits, while on Monday players can receive up to $75 as a part of the Monday Mojitos. Red Stag Casino will match deposit software and 85% as a part of the Bloody Mary every Thursday and 100% on Saturday. Players who participate in slots, video pokers and table games tournaments will also be eligible for a 25% regional active cashback. This is a part of the Pina Colada promotion that runs every month. The last thing that online casino players need to worry about is the safety of their funds or the fairness of the gambling operator. 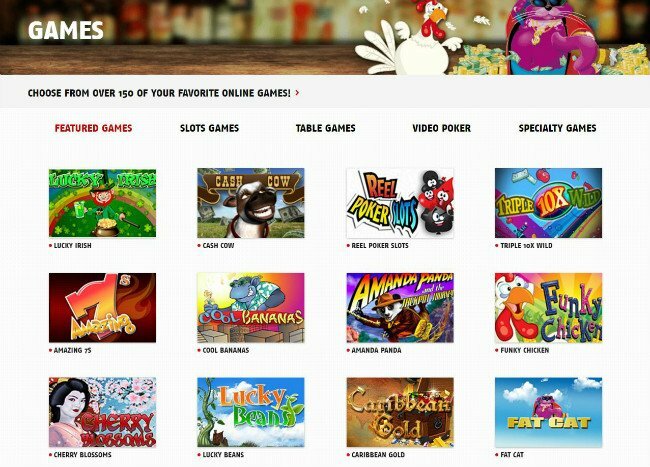 Red Stag online casino wanted to put all those concerns to rest as quickly as possible, so players can enjoy the best possible gaming experience. The government of the Dutch Antilles is the one licensing and regulating the casino. This compels the operator to have the random number generator audited for fairness and to publish the conclusions of the auditors. Deckmedia has a solid reputation and the best part is that all the casinos in this group are regarded as trustworthy operators. This positive image spills over redstagcasino.eu, which is quite new and requires time to build its own reputation. The relatively short list of payment methods and the equally slower Casino withdrawal times are the consequence of choosing certain financial instruments. However, there were no complaints regarding their fairness or their willingness to meet their end of the deal. The casino provides players with a chance to go over the financial transactions and their games history. This is the kind of information that only a handful of players actually monitor, but it’s good to know that the data is readily available. All the payout ratios of the games they offer are displayed next to the title of choice, so players can make an educated decision. To protect players from outside threats, the casino uses 128 bit SSL technology and firewalls. Sensitive data and financial transactions are encrypted. Those who sign up for an account with Red Stag Casino will discover that the list of payment methods is quite comprehensive for US standards. Even though Americans are frequently limited to credit and debit cards, such as visa, MasterCard and American Express, there are other options for international clients. Skrill and Neteller are preferred by those who have discovered the perks of using electronic wallets. Quick Cash, Sofort, and PaySafeCard have their fair share of fans and satisfied users for being faster. The Red Stag Casino withdrawal times differ based on the financial instrument chosen for such transactions, but it usually takes between four and 10 business days. A bit more problematic is the fact that all payment methods we meet the maximum withdrawal amounts to $2,000 per week. This is not only low for the casino industry overall, but even for US facing operators. It should also be at the top of the priority list for the ones responsible with managing this otherwise promising casino. There are a couple of other things that players need to be aware of, such as the fact that certain Red Stag Casino banking options require a fee. The worst-case scenario is to pay up to $30 as commission for using checks, but the amount is still completely justified. If you put into perspective all the legal hurdles and technical obstacles that the casino needs to overcome to serve US customers, these slight delays and small fees are more than acceptable. Red Stag customer support is available to all those who have signed up for an account. It doesn’t matter if players choose to dwell exclusively on play money games or wager real currency when it comes to receiving assistance. They can ask for help by using the online form, making a phone call or by writing an email to customer support. This is where things get interesting because VIP players have their own dedicated email address. The approach might raise a couple of eyebrows, but it is actually another way of having a dedicated account manager. All players can use the phone line 24/7 and there are toll-free numbers for American players. The free way of getting in touch with their experts without paying anything is the live chat system. It runs flawlessly on mobile devices as well as desktop computers, so players can easily get in touch with a specialist. Their team is made exclusively of tech savvy people, with a friendly demeanor and capable of solving all sorts of technical problems. It’s a pleasure to interact with their support, but assistance is rarely needed and that’s because of two distinct things. On one hand, the website runs so smoothly across all gadgets and the games are so responsible, that technical glitches rarely happen. Furthermore, the FAQ section is well documented and can provide answers to most of the questions asked often by players. Last but definitely not least, the user-friendly and rather simple interface guarantees speedy navigation even for absolute beginners. Red Stag Casino is such a young casino that it’s far too early to come up with definitive conclusions. So far everything looks great on paper and those who have signed up for an account are happy with what they get. It is the promotions and bonuses that catch the eye of prospective customers, but the best rewards are actually offered to active members. The VIP club is the place where the best rewards can be found, but each step made up the loyalty ladder will unlock new prizes. The payment methods are just enough to meet the relatively low expectations of US players. European gamblers are likely to settle for what is offered to them, except maybe for US dollars being the only currency accepted. The speed of transactions is once again debatable, based on the side of the Atlantic where the players reside. Red Stag Casino reviews are at least consistent when it comes to the security of these financial instruments and the trustworthiness of the gambling operator. The same mixed reactions are in regard with the software developer, as WGT is trailing industry leaders such as Microgaming and Net Entertainment. What they lack for graphics and visuals overall, they compensate through originality and creativity. Adding more games to the Red Stag Casino mobile section will definitely help, as well as paying more attention to the demands of live dealer fans. All in all, this is one of the better Deckmedia casinos and one that has a bright future ahead.